A new feature for Google Assistant will allow travelers to use the voice agent to check in for flights, the company announced at CES. Domestic travelers on United Airlines can say ‘Hey Google, check in to my flight,” to automatically be checked in. Passengers will also be able to retrieve their boarding pass with the Assistant on an Android or iOS phone. For flight confirmation in Gmail, the Assistant will send a notification to the phone as a reminder that check-in is available. 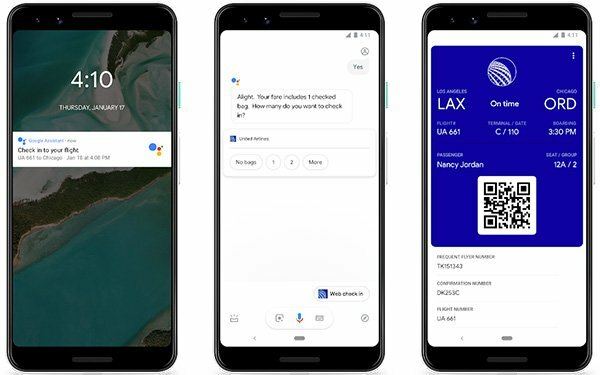 After checking in, the traveler can say to the Assistant ‘Hey Google, show me my boarding pass,’ without having to know the confirmation number. “We’re rolling out this feature first with domestic flights serviced by United Airlines, and we look forward to expanding this feature to more airlines and flights soon,” Google stated in the announcement. Google Assistant also can be used to book hotel rooms by voice with Google, partnering with hotels including InterContinental Hotels Group, AccorHotels and Choice hotels as well as agencies including Priceline, Expedia and Travelclick to facilitate the bookings.